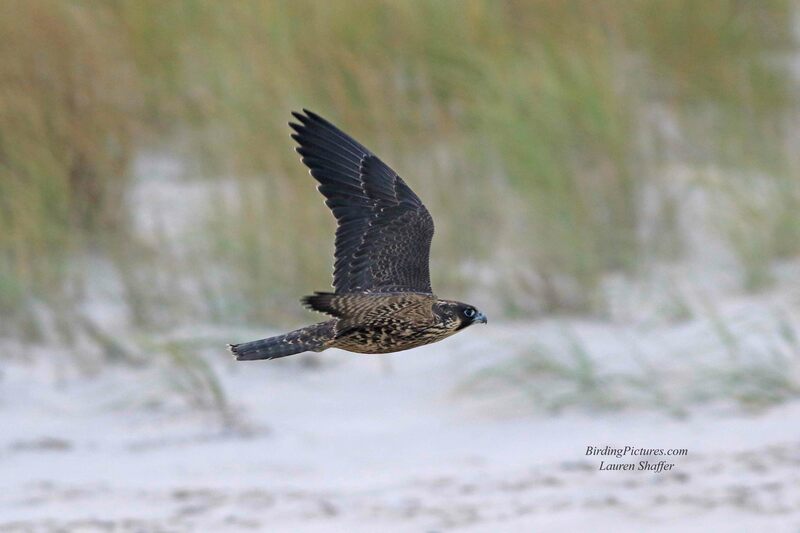 A Peregrine Falcon rarely fails to appear on our long walks out to Stone Harbor Point in New Jersey during our annual fall trip. It didn’t fail to disappoint this time either! I pointed out to my husband and friend on the way out, that right there on that dune is where we usually see one, but so far there were no falcons. We went most of the way out, identifying Black Skimmers and possibly Marbled Godwits far out by scope, and hurriedly started back when we saw that the tide coming in was going to make it tough to get back. As we came up to the place where we tend to see them, I suddenly saw a dark falcon come in low towards the dune, then circle around to the back of it and rise up on top. Surely he saw us there when he approached, but chose to land there anyway. Perching awkwardly at first, he then settled down for a good five minutes to watch us and the birds on the beach behind us that might make a good meal. We kept a respectful distance and he allowed all four of us to observe him and take lots of photos. What a handsome bird! Peregrine Falcons are crow-sized birds, our largest falcon with long tapering wings crossed over its back in the above picture. Adults are lightly barred on their white chest. This bird is a juvenile and appears dark all over, with black streaks running down its buffy chest. All Peregrines have thick dark sideburns, giving it the appearance of wearing a helmet. Adults have yellow eye-rings and ceres, the skin above the bill, while the juveniles have bluish as shown in these photos. 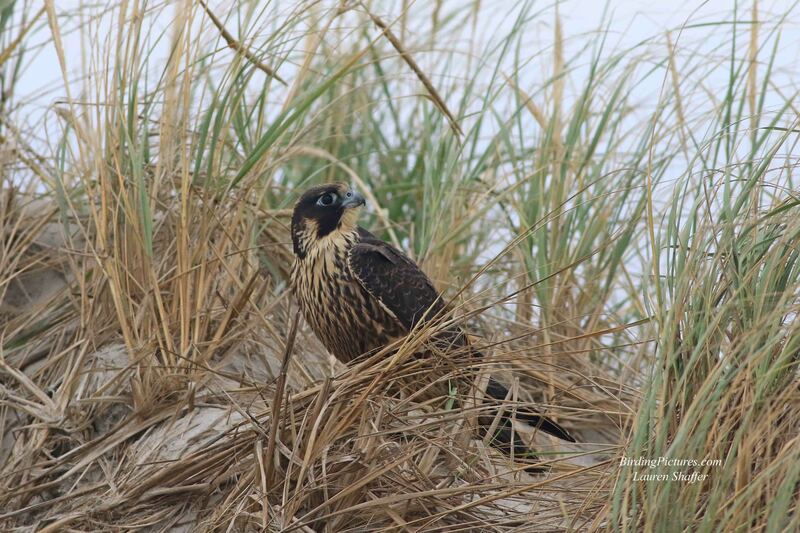 Peregrine Falcons will often hunt for shorebirds along the beach and can often be found there during migration. They are known for their incredible speeds of up to 200 mph when stooping from great heights and diving on their prey. 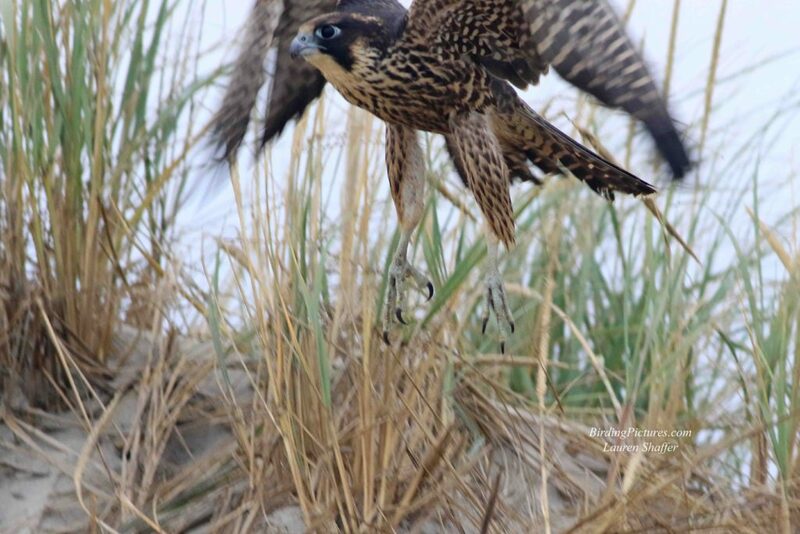 As we stood and watched, the falcon appeared restless, looked around, and launched himself straight up into the air and away towards the beach. He stayed low, even lower than eye level in this picture, and took off out of sight. What a thrill! 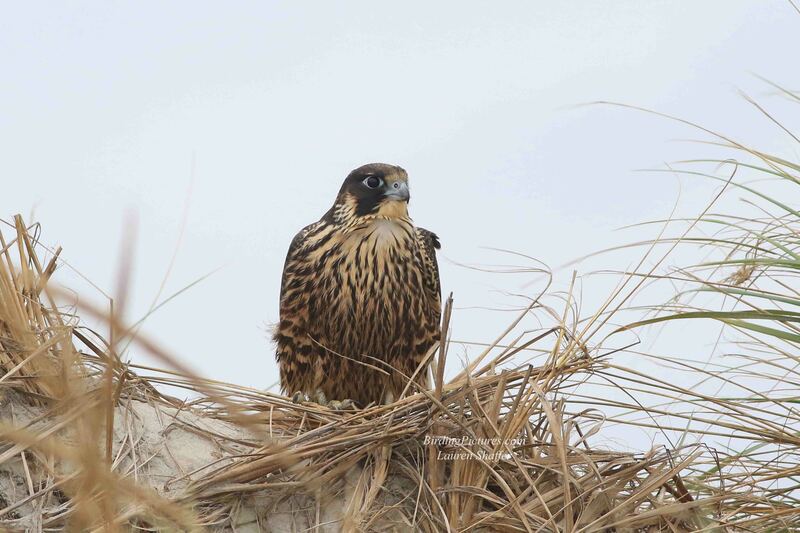 According to range maps, some Peregrine Falcons will remain for the winter. They are present along the Susquehanna River in Pennsylvania where we live, and some will also remain along the coast in New Jersey. 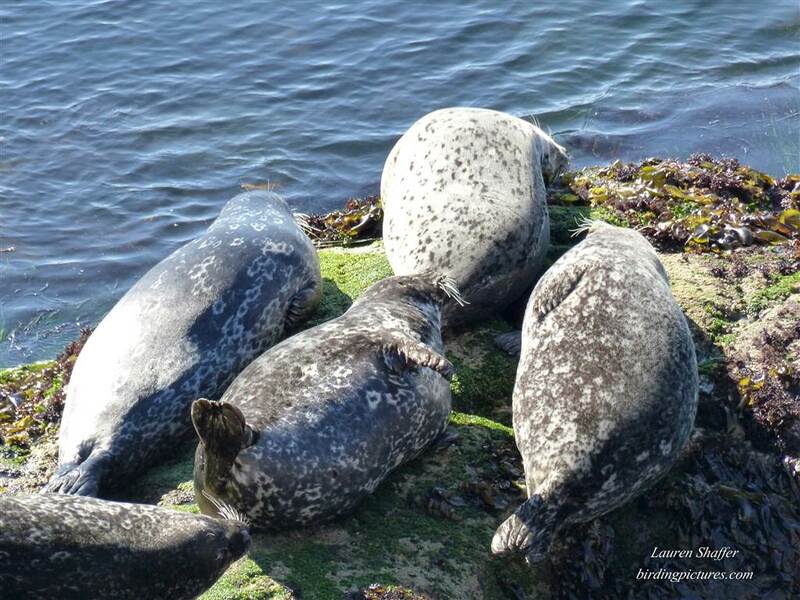 Many will migrate south, however, and will have plenty of prey to choose from on the way along the shoreline. Those that nest in the northern tundra have one of the longest treks of all birds during migration, as they travel over 15,000 miles in order to winter in South America. 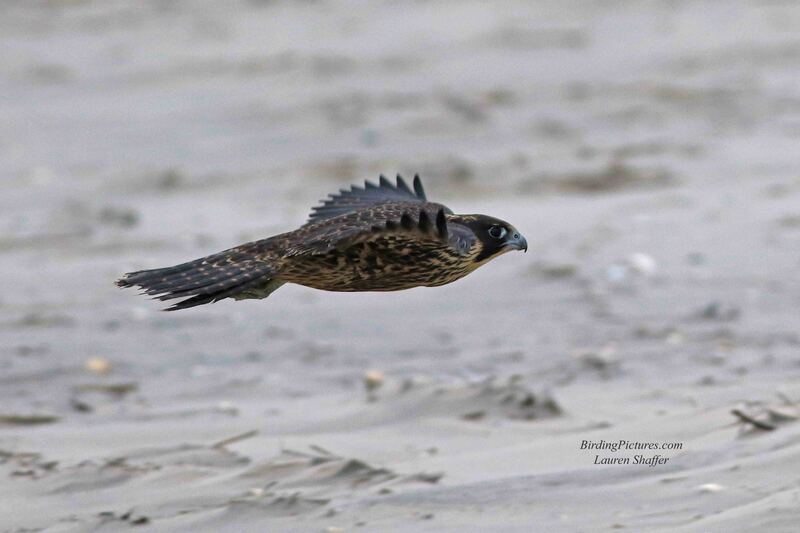 Seeing this Peregrine Falcon on the hunt was one of the highlights of our NJ birding trip! Peregrine Falcons–Banding Day! 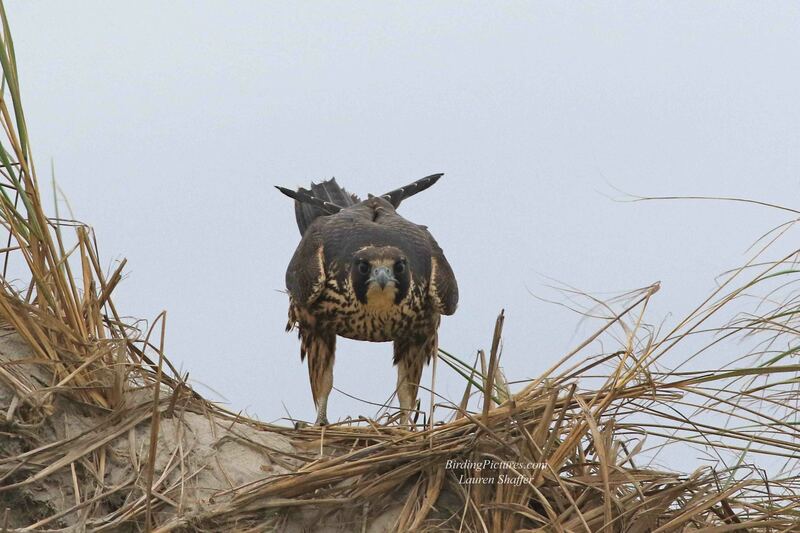 Peregrine Falcons–Ready to fledge! Harlequin Ducks at Barnegat Lighthouse, New Jersey Harbor Seals Tickling Each Other – Stop Pestering Me!